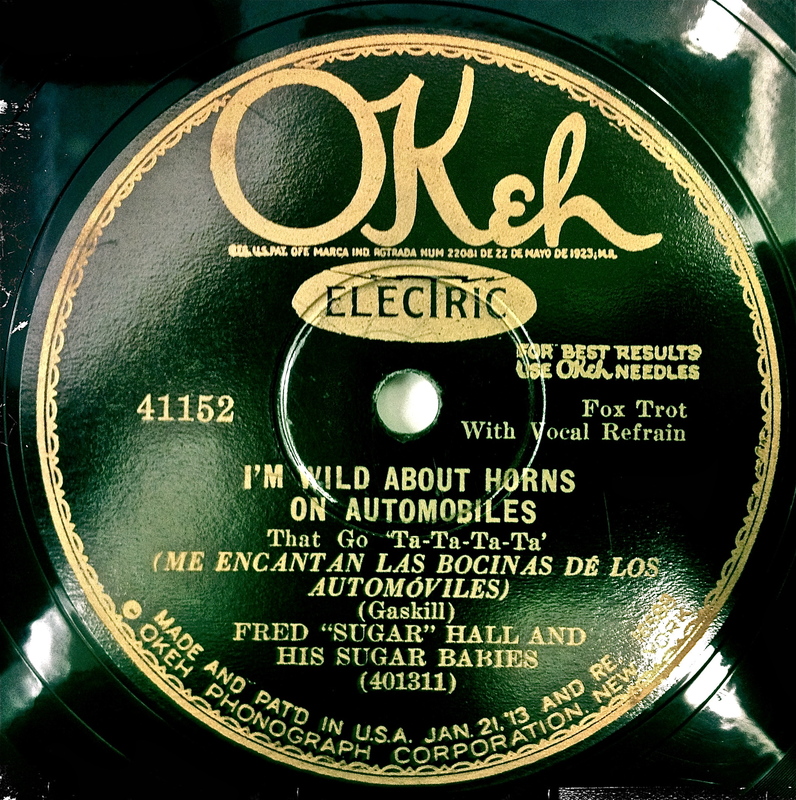 78: “I’m Wild About Horns on Automobiles (That Go Ta-Ta-Ta-Ta)” b/w “Come On, Baby” by Fred “Sugar” Hall and his Sugar Babies. Okeh 41152. Recorded in New York City, November 12, 1928. This little number was recorded by one of at least half a dozen bands that were led by Fred Hall. He seemed to change the name each time he switched to a different label—Fred Hall and His Roseland Orchestra was used for the Bell Label, for example, and Fred “Sugar” Hall and his Sugar Babies was used for the Okeh label. Hall—a pianist, band leader and composer from New York City—worked with singer Arthur Fields throughout most of his recording career, which spanned from 1925 to 1932. Like George Gershwin, Jerome Kern and Lil Hardin Armstrong before him, Fred Hall started out as a song-plugger. In the early days of the recording industry, when music stores were still selling more sheet music than actual recordings, customers would hand the desired piece to in-house piano players called “song-pluggers,” who would then play a portion of the song for all to hear. One imagines that doing this every workday would be a great help in learning what makes the listener part with their cash and what makes them move on to the next song.